Join us as we share best practices & new ideas, connect a growing community of people with passion for advancing gender equity through the power of enterprise, and those who simply want to connect feminist values to how they run their business. 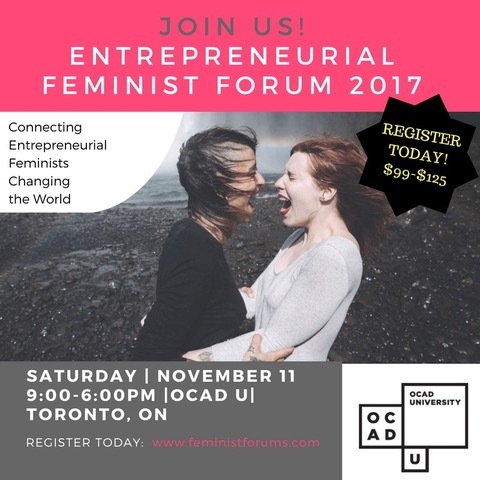 This will be a unique learning opportunity for entrepreneurs, startup professionals, business coaches (and feminists of all genders) that should not be missed! Dr. Dori Tunstall, Dean of Design at the Ontario College of Art & Design University. In Un-Designing Gender Inequality: Innovation through the Seven Principles of Design Anthropology, Dori will share her seven principles of Design Anthropology and its relationship to the Mandala of Cultures-Based Innovation developed by a global community of anthropologists, designers, strategists, and Indigenous activists/scholars. Dori will outline how these frameworks can be used to ethically approach the understanding of cultures, the design process, and the experience of innovation for Indigenous, migrant, and racialized communities so that innovation is not seen as Colonialism 2.0. Dori activates the frameworks by showing feminist/womanist projects that align with them. Dr. Barbara Orser, Telfer School of Management, University of Ottawa and co-author of Feminine Capital. Unlocking the Power of Women Entrepreneurs. Dr. Orser will spotlight how Canadians are employing feminist values within their business practices. In doing so, entrepreneurs are creating new brands, building new business models and challenging public policies. C. V. Harquail, PhD, Feminists at Work & Stevens Institute of Technology. In “Feminism Foundations: Key Concepts and Points of Unity,” CV will help us understand of concepts and values that connect different perspectives on feminism. We’ll consider why feminism is more than “equality” between “men” and “women”, and why it embraces anti-racism, anti-classism, and other movements for positive social change. With a lightning quick introduction to key concepts like gendering, essentialism, patriarchy, kyriarchy, standpoints, and intersectionality, we’ll gain a working language for new conversations. Once we distinguish between critical and constructive feminism, we’ll co-develop values that offer points of unity across our different paths towards a feminist future. The goal of this session is not to provide “the” definition of feminism, but to bring us to shared starting points so that we can connect our work. More details to be announced. This is just a snapshot of the EFF community! City of Toronto & OCAD University. How can we enable smart citizens to co-design better services in cities? In this interactive workshop, you will learn about how co-design can enable smart citizens’ capability for co-designing better public services. We will look at design as a tool for transition to a common community-building process. This workshop is based on work done by Desis Lab Elisava to engage citizens of Barcelona in co-production processes (see here for more). The city of Barcelona faces challenges for achieving higher quality, more realistic and sustainable public services. The Municipality of Barcelona is committed to collaboration with citizens and local stakeholders to explore what citizen-led smart cities can look like, such as improving efficiency of services (read more here). Who should participate: This case study and workshop is for public sector innovators, design civil servants, policy makers, service designers, city builders, and lab practitioners (and any others who want to help make Toronto a better place). Professor of Design for Social and Digital Innovation at Elisava Design School and Engineering, Arianna is Leader of DESIS Lab ELISAVA-DESIS Network. She is also Director of the Masterlab in Service Design for Place and Community Building (http://www.elisava.net/en/studies/masterlab-service-design-place-and-community-building), the Research Group and Collective CAMBIO and co-leading TIME (Teaching Innovation through Experiments group), dedicated to the transition from old to new design education scenarios and training professors, practitionnaires, designers, artists, makers interesting in researching through creativity and design. She is also curator-maker of creative formats for festivals ( Open Design Festival Capetown, South Africa; Armenia Art Fair-Design Conversations), collaborating with museums outreach programs( V&A Digital Design Weekend), Fablabs network and emergent design and performing arts hubs( Marseille Living lab) to foster multidisciplinarity, peer to peer learning and collaboration. She had worked in Cameroon, Turkey, Armenia and South Africa for Local Govern on civic-coproduction programs for the future creative scenario of community building, participation, and collaboration and civic commons- community building using creativity format as platform of social and digital innovation. She works and collaborates regularly with UNIFEM, UNESCO, EESC-European Economic and Social Committee, United Nations, Victoria and Albert Museum, Xschool, GSMA, Open Design Festival Cape Town, and European Network of Culture and Creativity. Our mission is to effectively integrate design, strategic foresight, business model innovation, and systemic impact into the social innovation space. Strategic review and design research on the “min spec” for social innovation hubs in Toronto was compiled in the Fall of 2016, with a focus on MaRS. Summary Findings to be posted here. Part of the research team (Christine, Melissa, and Ned) applied the Platform Design Toolkit to design an innovative solution for a client in early 2017. Findings from their experience will be posted here. Ned Rava has finished a comprehensive research on “Policy Design: Towards Understanding and a Methodological Framework” that was presented on March 21, 2017 as a part of the Design Explorations series of the sLab. This was followed by a research paper “Policy Design: From Technocracy to Complexity, and Beyond” prepared jointly with professor Guy B. Peters, a Maurice Falk Professor of American Government at the University of Pittsburgh, that was presented at the 2017 Annual Conference of the International Public Policy Association in Singapore. Dr Ned Rava developed a new methodology for Platform Business Design, focusing primarily on platforming of the existing business (fully or partially) of conventional organizations. The methodology is based on design methods and innovation tools that lead to fundamentally different business model from the conventional (assembly-line, pipeline) model. Special emphasis was put on networks, hubs, labs, and other organizations with large ecosystems and a potential for peer exchanges at scale. The methodology development included a prototype for a University. Ned presented this approach in the lecture on Business Innovation at the MBA course of the Rotman School of Management, University of Toronto on November 8, 2017. This paper will propose a new business model for social innovations hubs and how they deliver value. Dr Ned Rava has prepared a new "Foresight Manual: Empowered Futures for the 2030 Agenda" for the Global Centre for Public Service Excellence, Singapore. The manual representes a comprehensive overview of concepts and methods of strategic foresight for government practitioners. 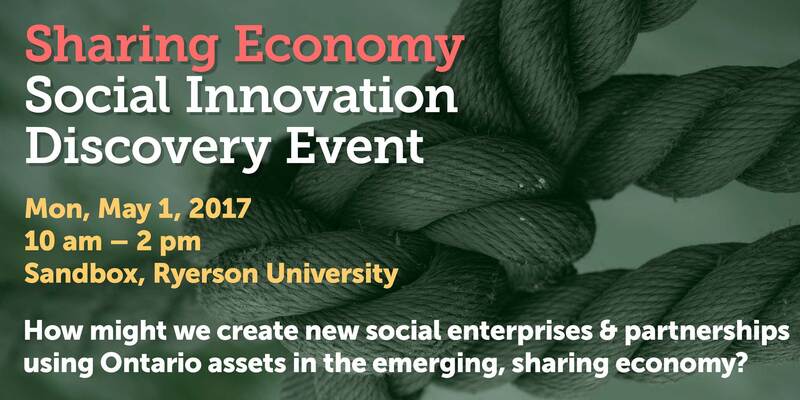 This event invites Ontario thought leaders to join in co-creating opportunities leading to meaningful social impact in the emerging, sharing economy in the near future. This exciting project is supported by Ontario’s Ministry of Finance (MOF) and Ministry of Economic Development and Growth (MEDG). Project phases are structured to reveal and activate opportunities in this complex space. Phase one is a Discovery Event with diverse experts working in teams through facilitated, strategic foresight exercises to uncover insights and arenas, such as elder care, homeless, and urban farming, in which Ontario is well positioned to drive new social innovation, based on unmet needs and untapped strengths. In line with these insights, phase two will work with provincial government to uncover assets that could be leveraged to support new or enhanced social enterprises. Phase three will convene a large Design Jam with leaders from social enterprise, sharing economy, government and student communities joining forces. In this large, diverse, multi-day event, scheduled in early fall, awards for promising ideas will be provided by sponsoring provincial ministries. Participants receive the phase one report & may express potential interest in future events, and have been encouraged to give their invitation to a peer if unable to attend. Together part of this exciting opportunity to create social impact by maximizing the assets we own as Ontarians! All events are at accessible facilities. Three teams from OCAD University made their way to the Hult Prize 2017 Regional Finals in Boston, London and Shanghai. Nine of the ten OCAD U MDes students are enrolled in the Strategic Foresight & Innovation program (SFI) and the tenth is a Digital Futures (DFI) student. Join us in congratulating the great achievement of Team Hive: Tania De Gasperis, Daniel Ura, Sugeevan Shanmuganathan; Team Sage: Courtney Cooper, Vince Galante, Ziyan Hossain, Lisa Hart; and Team Forsati: Alastair Woods, Jessica Thornton, and Lindsay Clarke. This special event brings together catalysts for individual and collective development of entrepreneurship and social innovation in Northern Ontario: government representatives, community organizations, industry, academic experts, and young people. Using a Design Thinking process, we will gain new and fresh insight into persistent issues in an interactive format. "How might we diversify our economic foundation, support young people in transition, build and foster diversity and revitalize downtown areas in Northern Ontario cities?" A Collective Discussion for Northern Ontario is a unique event for 50 people at two locations, to explore economic development and social innovation in Northern Ontario, through Design Thinking processes. The speakers will be simulcast to both locations, and the workshops will be facilitated locally with north / south shared reporting. This gathering, which is the precursor to a larger conference in Summer 2017, will be led by OCAD University and Algoma University in a unique partnership between Northern and Southern Ontario institutions, bringing together in depth knowledge of entrepreneurship and social innovation from the North and Design Thinking processes from the South. Expert "Lightning Talks" will set the context, describing entrepreneurship and social innovation in Northern Ontario and proposing why is it important as an engine economic development as well as for social change. The interactive sessions facilitate connections and conversations, bringing clarity to the topic, surfacing existing initiatives, nurturing potential partnerships and strengthening collective commitment to entrepreneurship and social innovation in Northern Ontario. The results of this conference will shape a larger conference called INTERSECTION in North Ontario: Entrepreneurship and Social innovation. This will be a larger, two-day event in the city of Sault Ste. Marie, which will build on the August conference and develop further conversations and connections across Northern Ontario. Andre Morriseau (Ojibway) is Director of Awards and Communications for the Canadian Council for Aboriginal Business (CCAB) and an enthusiastic advocate and ambassador for Aboriginal arts, culture and public affairs. A member of Fort William First Nation (Thunder Bay) where he maintains a home, Mr. Morriseau is based in Toronto. As former host of UrbaNative at CIUT, and Nation to Nation on Aboriginal Voices Radio, he shared countless stories of Indigenous peoples' experiences. Andre also worked for National Aboriginal Achievement Foundation (NAAF, now Indspire) and Chiefs of Ontario (COO). He has served on boards including Ontario Arts Council (OAC), ImagineNATIVE Film and Media Arts Festival, Native American Journalist's Association (NAJA) and Toronto Council Fire Native Cultural Centre. Mr. Morriseau is recipient of City of Toronto Aboriginal Affairs Award and Jer’s Vision Canada’s Youth Role Model of the Year Lifetime Achievement Award. Rebecca Commanda “Wayna Booozhoo, GichitwaaNagamon Kwe Ndizhnikaas, Genaabaajing ndonjibaa, Makwa ndoodem, Odawa minawaa Algonquin Kwe endow. Hello, My spirit name is Sacred Song Woman. My home community is Serpent River First Nation. I am part of the bear clan. I am a woman from the Odawa and Algonquin Nation. My English name is Rebecca Ursula Mary Commanda.” Rebecca is a recent graduate that received an Honours in Sociology and a minor Anishinaabemowin Program at Algoma University and Shingwauk Kinoomaage Gamig. She was part of Shingwauk Anishinaabe Students Association (SASA) for three years and during her time on SASA the goal was to ease the transition of Anishinaabe, Metis and Inuit students to Sault Ste. Marie by creating a community! Gayle Broad has been a life-long agent of change in Northern Ontario, working with low-income people, women, First Nations and others to create a society that is more just and equitable. For the past 15 years, Gayle has actively supported the development of a new generation of social innovators through teaching and mentoring students both within the classroom and the community, as an Associate Professor of Community Economic and Social Development (CESD) at Algoma University, and as the Director of NORDIK Institute, a community-based research institute. Ashleigh Sauvé As a student and community activist, Ashleigh Sauvé consistently worked towards social, environmental and economic justice, so it was not surprising that when her non-profit employer was forced to close its doors, she would seek new and innovative ways to continue that work. Determined to stay in her home town of Sault Ste. Marie, Ashleigh decided to create her own job, bringing her extensive community networks into the creation of her social enterprise, Shabby Motley Handcraft. For the past 3 years, ‘Shabby’ has become acafé well-used by crafters – especially knitters - and community activists, and a progressive employer that engages staff in all facets of business planning, marketing and service innovation. Ashleigh stays true to her principles of encouraging the local economy, promoting environmentally friendly products and most recently starting a new business, Cordelia’s Plant Based Foods – a vegan take out! If you are unable to attend after registering for any reason let us know at least 24 hours in advance. Failure to do so will result in the loss of your deposit. A post-workshop survey must be completed within four (4) days of the event for deposit to be refunded. The deposit is to avoid no-shows – it is a proven way to ensure attendance or timely cancellation. Citizen Centred Innovation: International Certificate Course. 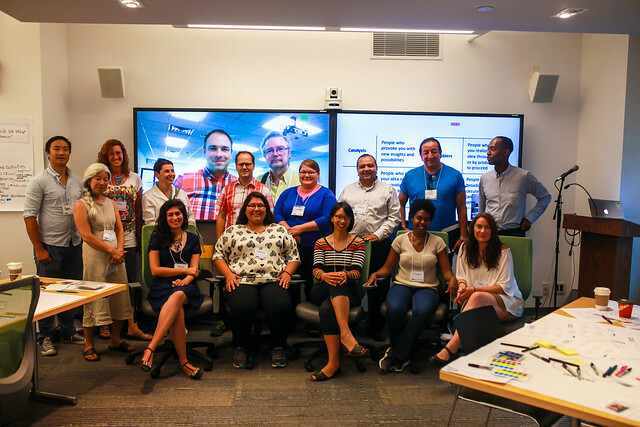 This program provides intensive executive-level training on methods and techniques to address complex social problems in a multidisciplinary way. The workshops focus on urban food waste as an example of a complex social problem to address. The methods and techniques are transferable to other complex social, environmental and business challenges.